Thursday, January 24, Cedar Rapids, IA – Applications are open for Iowa teachers to learn how to teach computer science through NewBoCo’s Code.org Professional Learning Program. So far, more than 230 elementary, middle, and high school educators have participated in one of NewBoCo’s Code.org programs, bringing computer science courses to more than 6000 students throughout the state. NewBoCo, a Cedar Rapids-based nonprofit, plans to offer three locations for CS Discoveries (grades 6-10) and two locations for CS Principles (grades 9-12) this year. There will be locations in Eastern and Western/Central Iowa, and each location can have up to 32 teachers per cohort. 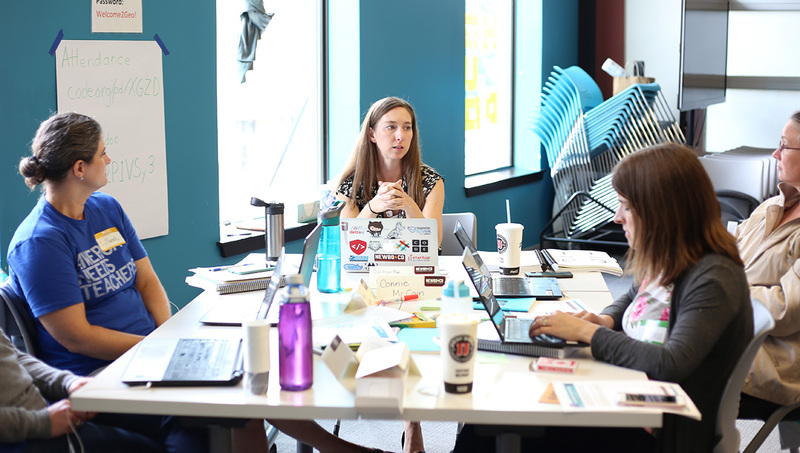 For K-5 educators, NewBoCo holds 1-day workshops featuring Code.org’s CS Fundamentals curriculum, which can be held anytime during the year and scheduled throughout the state. Applications close in April or when spots are filled. To apply, click here. If you have questions, contact Dahlby or register for her virtual info session for teachers and administrators on January 30. The cost for one teacher to be trained is $110 for CS Fundamentals, $2,400 for CS Discoveries, and $2,000 for CS Principles. All three of NewBoCo’s Code.org curriculum training opportunities have been selected as 2019-2020 STEM Scale-Up programs to help cover funding for participants. Educators must apply for the STEM Scale-Up award by March 4 as well as for NewBoCo’s Code.org programs (CS Discoveries and CS Principles). There are no applications for CS Fundamentals (grades K-5). These are 1-day workshops for K-5 educators on Code.org’s CS Fundamentals curriculum can be held anytime during the year and scheduled throughout the state. Schools that have received funding from the Computer Science Professional Development Incentive Fund from the state can direct those funds to pay for this program. There are limited scholarships available from GoDaddy for educators teaching at high-need schools. More information is available in the application. For schools applying for Computer Science is Elementary, our professional development programs can provide the relevant curriculum and training for the recipients’ implementation plan. The Computer Science is Elementary application opens January 22. Through a partnership with Code.org, a national nonprofit, NewBoCo offers professional development workshops to train current teachers how to teach computer science.